Signature Hardware adds new, contemporary line of resin tubs and sinks to its exclusive Whittington Collection. Known for their selection of freestanding tubs, Signature Hardware has added a new line of resin bathtubs and sinks to its exclusive Whittington Collection. Featuring sleek curves and contemporary shapes, these new resin pieces perfectly complement modern bathrooms. Beautiful in both form and function, Signature Hardware offers the freestanding resin tubs in five diverse styles. The tubs range in design from the super smooth curves of the Winifred or Kaya to the rectangular, sloped edges of the Edie. Customers can also choose to soak away their worries in the Susanna slipper tub, the extra-deep Lucina (shown at right, upper) or the extra-long Edie. Customers can also order freestanding or wall-mounted tub fillers in a variety of finishes with the resin tubs to complete the look. All of the resin tubs come with a five-year manufacturer's warranty and are delivered by truck, to your residence, to your curb, including the crate and lift-gate service. The fluid, minimalist style of the freestanding resin tubs is mirrored in the pedestal and vessel resin sinks. 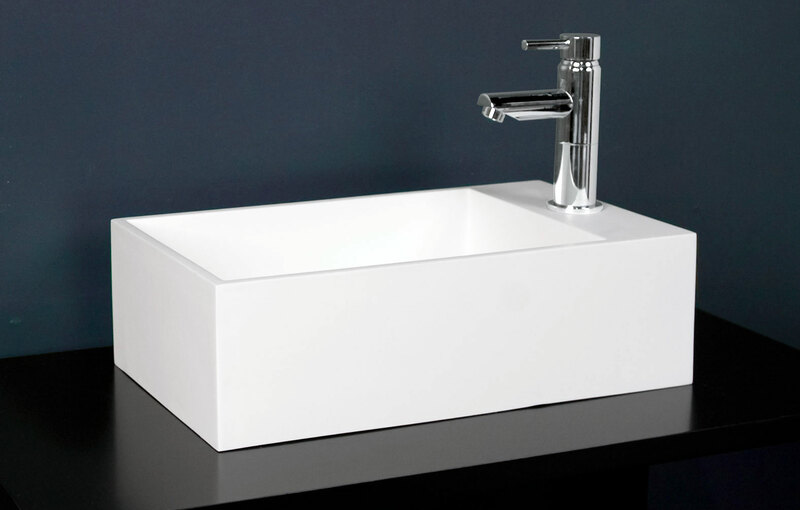 Customers can choose to complement or contrast the lines of the tubs with the smooth, gentle curves of the unique Tayen pedestal sink or the corners and straight-lines of the Nevie vessel sink (shown at right, lower). No matter what theme the customer is looking to pursue, Signature Hardware has a sink to match. In addition to the beauty of the tubs and sinks, their poly-resin blend composition makes them durable enough to withstand everyday use. These stone-like bath products have a matte finish that is easy to maintain. All styles are available for immediate shipment. Signature Hardware offers free shipping within the 48 states on all of the resin bath tubs and sinks. 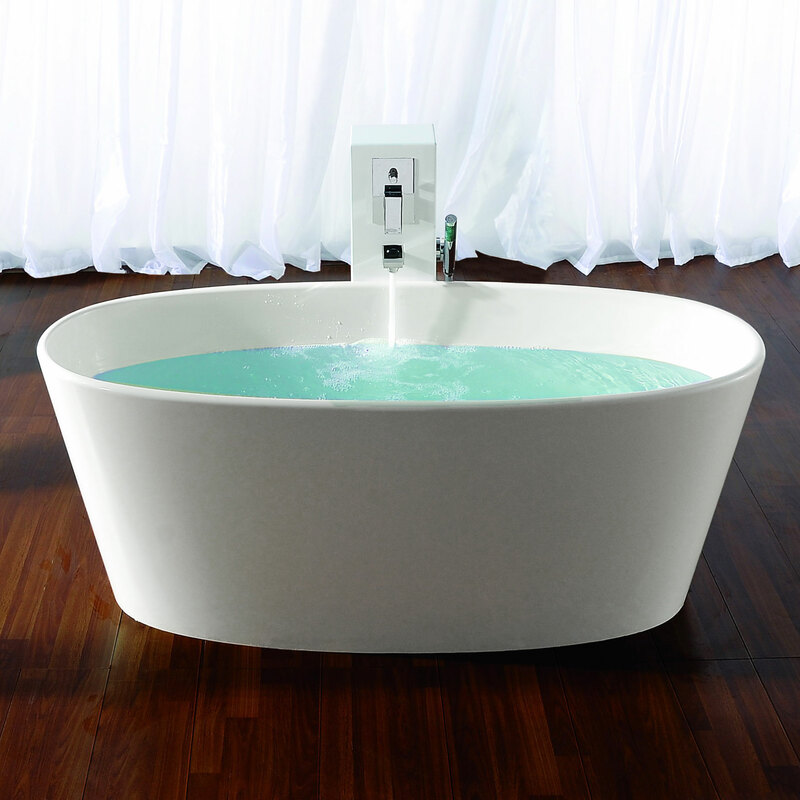 Prices begin at $2694 for the tubs, $860 for the pedestal sinks and $325 for the vessel sinks. Signature Hardware also offers a number of matching of freestanding or wall-mount tub fillers, lavatory faucets and drains, and other accessories for the resin tubs and sinks in the Whittington collection. Made from high-quality materials and available in a variety of styles and finishes, these items and more can be seen online or in the company's free catalog. Customers are invited to order a free catalog online at http://www.signaturehardware.com/freecatalog or by calling customer service toll free at 1-866-855-2284. Signature Hardware is a direct merchant of antique-style reproduction fixtures for the home. Working directly with the factory and selling direct to the end consumer, they are able to provide superior service and exceptional value. The firm distributes its products nationwide, and sells direct to the consumer by the use of print catalogs, their retail showroom located in the Cincinnati area, and over the web. Visit them at: http://www.signaturehardware.com.